This post may contain affiliate links. Please see the Disclosure Page for more information. Europe has a special place in our hearts. If Europe is on your bucket list, this post is for you. Recently, I was approached about tips for traveling to Europe. Thankfully, I was given dates, 5/25-6/02, so I can now give some specific suggestions. You get to be a fly on the wall as I give travel advice that helps explain my 7 step travel process in more detail. Read my open letter to a fabulous woman who works super hard and wants to treat herself to a trip to Europe. Disclaimer: Prices are from third-party websites and are subject to change at any time. Also, data provided is for informational purpose only. Use at your own risk. Please see Disclosures for more information. Get your documentation in order. Make sure you have a valid passport book. Head over to Skyscanner (my favorite travel site). 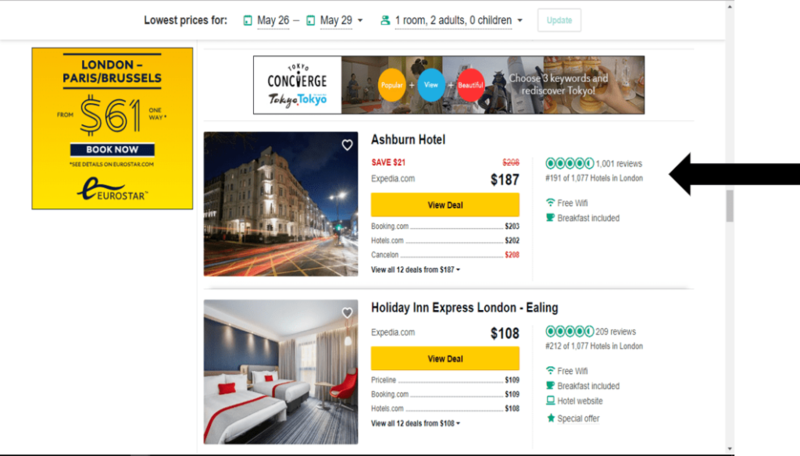 The photo below shows a great feature on the site, the ability to search without choosing a destination. 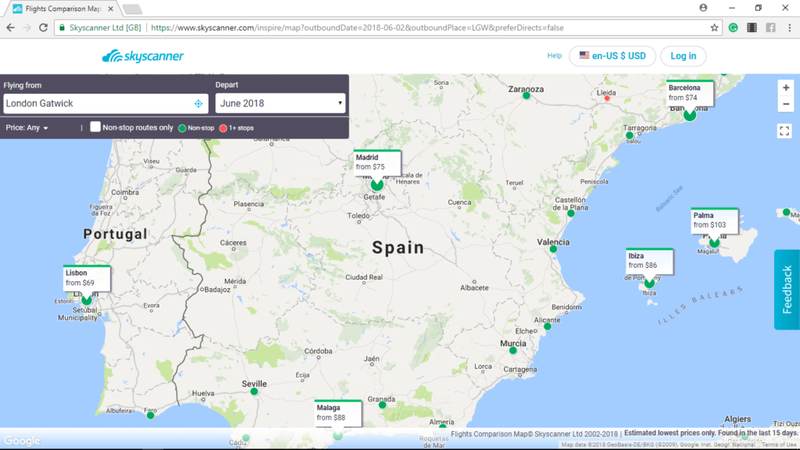 However, I know you want to go to Europe, so, I scrolled that map to cover Europe and added May 2018 as your departure date. Look at all this good travel information! When I zoom in you’ll notice, I can begin choosing locations in Europe with low flight prices. 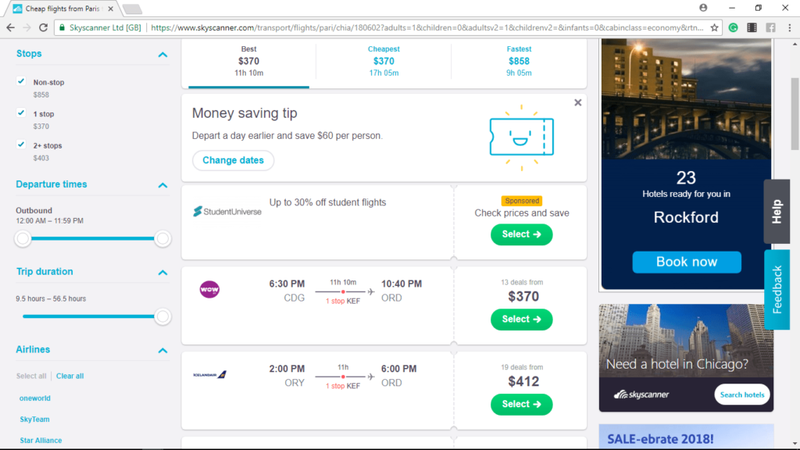 Based on the information I see here, I would choose to begin my flight search by flying to London; prices are below $380 for a one-way! This is a great deal and it’s a non-stop flight! Oh, snap! Are you getting excited yet? Maybe you aren’t excited about visiting London. That is OK! Just because you fly to London doesn’t mean you have to stay or visit the city. 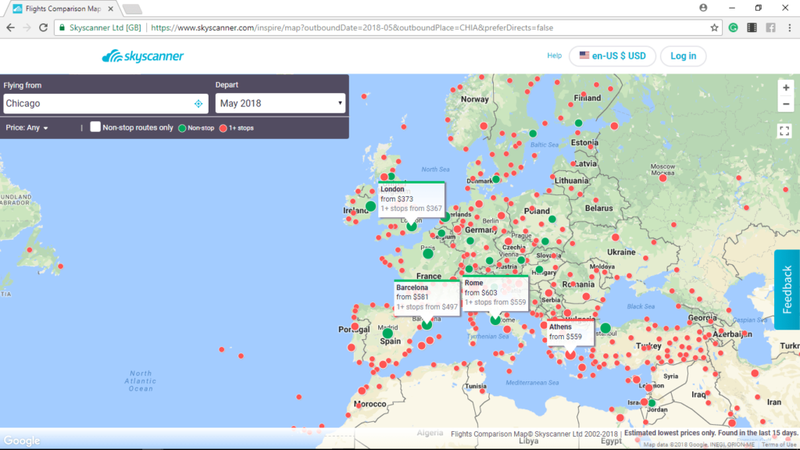 You are just using the city to get to Europe on the cheap! You can use the flight to London as a layover. Then you have the option to fly or take a train to another destination. I did this before, check out this post to learn more about my experience. Let’s take a look at a few travel opportunities. 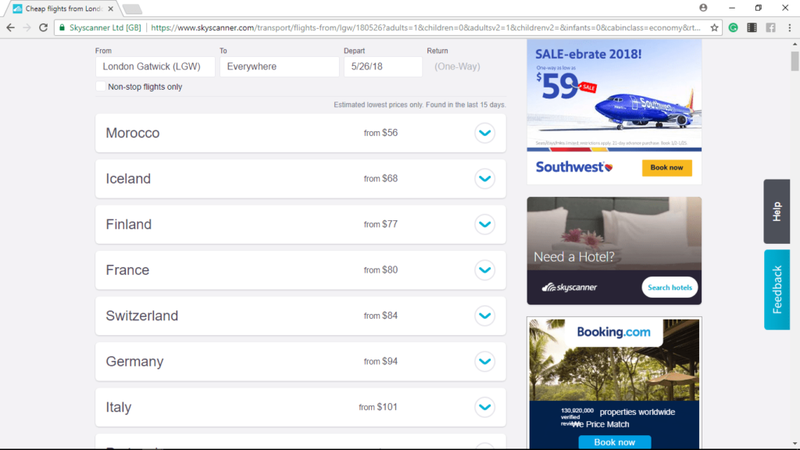 If you were to book the Norwegian flight for $322, you’d arrive in London on 5/26 before 6 am. Check out all the inexpensive options you have for further travel. And this is just flight travel. You actually have lots more options because Europe is known for affordable train travel. Let’s say France or Spain is high on your travel wish list. I would recommend Paris or Spain (Madrid, Malaga, or Seville). <~~~ All places I love! Getting to these destinations from London is super affordable. 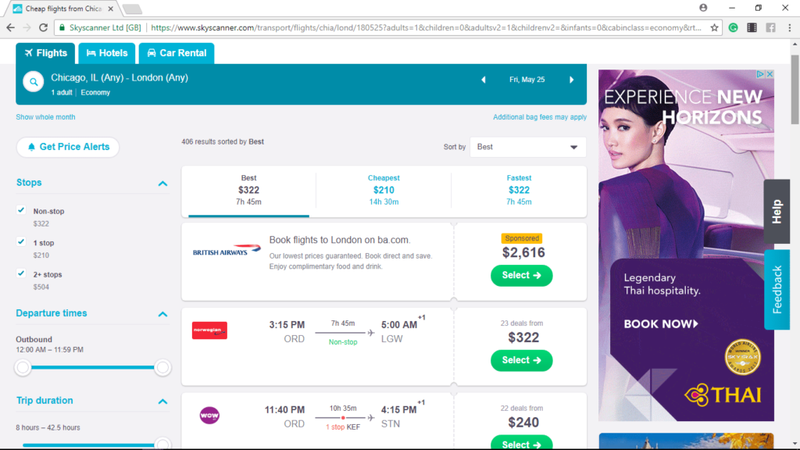 Ok, Let’s recap: From Chicago, you can fly to London for $322. Now, here are two options. OPTION 1. Stay in London and have some fun, then take a train to Paris or another destination for cheap. If you decide to go to Paris from London, you can fly home from Paris on 6/2 for ~$400. Fly to London on 5/25. Arrive in London on 5/26. Stay a few days. Take a train to Paris, stay a few days. Use this site to find train travel. OPTION 2. Don’t leave the London airport and fly to another destination like Spain. City-hop around Spain by train or choose one city. Madrid or Barcelona are great options. Whether you decided to city-hop or just vacation in one location, make sure your last destination is somewhere you can fly home for cheap. 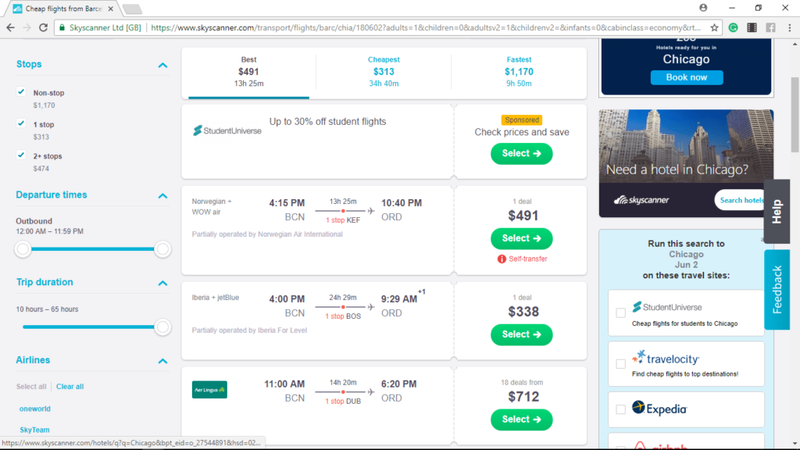 If you were to fly home from Barcelona (BCN) it looks like it could cost ~$338. Arrive in London on 5/26. Fly to Madrid on 5/26. Stay a few days. Take a train to Barcelona. Stay a few days. Fly home from Barcelona on 6/2. Of course, you have more than these 2 options but this is how I would begin to plan a trip to Europe. Ok. I think you get the idea about flights. Now let’s look at hotels. I’d suggest beginning with TripAdvisor. Choose the amenities you prefer. I highly suggest including free wi-fi and free breakfast. 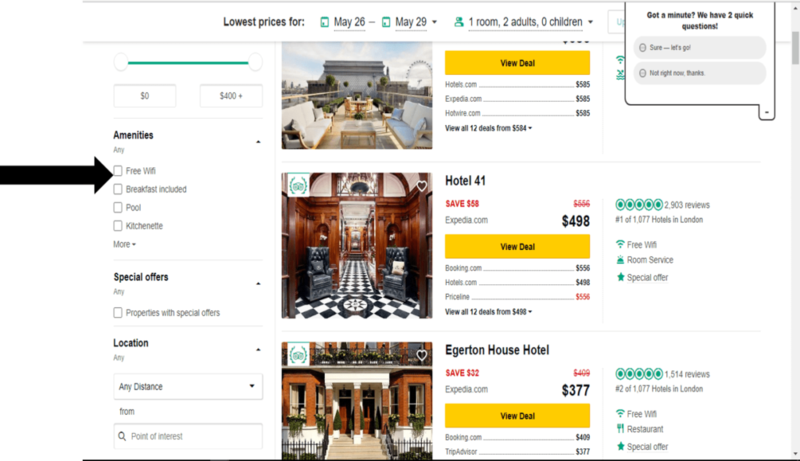 Most important find a place within your budget that has good traveler reviews. For this case study, pay close attention to dates. If you fly out of Chicago on 5/25 to London, you will not arrive until 5/26. Therefore your first night at the hotel will be 5/26. If you decide to visit multiple cities, make sure the dates for the hotel nights are correct. I usually create a spreadsheet to help keep up with dates and changes in times if I am city hopping. Find places that fit your budget. Also, I recommend making proximity to public transportation high on your list of amenities. The prices I’ve found for the trip seem reasonable but perhaps you are looking to travel with reward miles. If you are traveling in May, you have time to take advantage of a mileage offer on a credit card. My favorite travel credit card is the Chase Sapphire Rewards Card (affiliate link). However, American Airlines Citi Card currently has an offer of 60K miles that may work better for you. Check out both offers and find out if they could work for you. *In my experience, 60k miles has been equivalent to one roundtrip ticket abroad. If you trust yourself to accumulate miles with a credit card without accumulating debt, this is a great opportunity. Do research and learn about how travel reward programs work. Choose a mileage program that can get you to Europe. Most likely they are offering a credit card that will give you thousands of miles within 3 months for spending X amount of money. We use the card for 3 months or less for expenses we already have. We don’t use money we don’t already have in our bank account for any purchases. Also, we pay the card the same day we use it or within the week of using it. You aren’t winning if you get stuck paying interest. Within 3 months we get the miles. This usually offsets the price of our flight tickets, minus taxes. We use the miles to travel. Take time off from work. Let your bank institution know you are leaving the country. Look up currency rates for countries you plan to travel. Add Clocks (App or settings) for destination countries to your phone. Add language App to have fun speaking a few words with the locals. Find out if your employer offers travel insurance in the benefits packages. Choose to travel with a travel card that offers no foreign transaction fees. Plan how you will get to and from the airport. Make copies of passport and itinerary and leave with trusted family or friend. Make plans for your vehicle. You saved, you did the work. Now, go and enjoy yourself. I hope this helps. You got this. Take your fabulous self to Europe and have a safe and fun adventure. I’d love to hear all about it when you return. OK, this letter/guide was for one person but hopefully you find it useful. This is my travel process put in action. It was lengthy but I wanted to be thorough. Travel is possible on most budgets but it takes a bit of budgeting and planning. Make this year the year you see the world. Have questions? Be sure to ask them below in the comment section. Also, where in Europe are you headed? Hi there! We are Justin and Tiffany Green, plant food enthusiasts and travel obsessed parents living a simple life in North Carolina. Our goal is to live well and travel far as a family. Hopefully, we can inspire you to do the same.